SHIVER is an exciting and terrifying thriller based on the highly praised novel by acclaimed author, Brian Harper. It has been characterized as the best “woman in jeopardy” - “female empowerment” material since Audrey Hepburn in “Wait Unti;l Dark”. 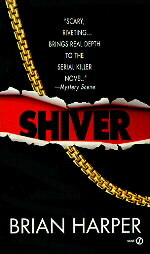 A republication of the SHIVER novel as a film-novelization tie-in is planned once the film is announced for production. A great book, extremely well written, exciting !, Brian Harper is the best at his genre by far. 'SHIVER is so well written. It has pace, plot, depth, style, buildis tension. It's the top 1 or 2 of my favorite books. Of the popular authors, I've read J. Patterson, Crighton, Koontz, Grisham, Sanders, etc., Harper is the most polished by far. 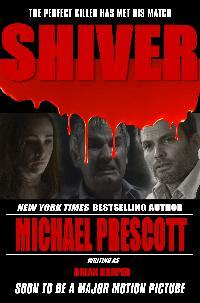 'Shiver' has style, it gets your heart to really start racing - I love that in a thriller. The characters have depth and they're believable. Wendy's heroics are great. It's a great, quality , entertaining book! I'd give it an 11 if I could. Keep em coming Mr. Harper. Edge of your seat action. A lot of fun to read. Takes you inside the mind of killer and victim. It gives you a great sense of "being there". Definitely a good read. A great book! It draws you in from page one! What follows will keep even the most restless reader on the edge of their seat. A realistic, thrilling novel , it's a definite "don't miss"for suspense fans.